For other uses, see Neath (disambiguation). Neath (/niːθ/; Welsh: Castell-nedd) is a town and community situated in the principal area of Neath Port Talbot, Wales with a population of 19,258 in 2011. The wider urban area, which includes neighbouring settlements, had a population of 50,658 in 2011. 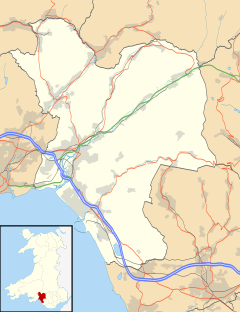 Historically in Glamorgan, the town is located on the river of the same name, 7 miles (11 km) east northeast of Swansea. Historically, Neath was the crossing place of the River Neath and has existed as a settlement since the Romans established the fort of Nido or Nidum in the AD 70s. The Roman fort took its name from the River Nedd; the meaning is obscure but 'shining' or simply 'river' have been suggested. Neath is the Anglicised form. The Antonine Itinerary (c. 2nd century) names only nine places in Roman Wales, one of them being Neath. There is evidence of undated prehistoric settlements, probably Celtic, on the hills surrounding the town. The fort covered a large area which now lies under the playing fields of Dŵr-y-Felin Comprehensive School. In the late 1960s, there were reports in the local media of a massive Roman marching camp being found above Llantwit which would have accommodated many thousands of troops. St Illtyd visited the Neath area and established a settlement in what is now known as Llantwit on the northern edge of the town. The church of St Illtyd was built at this settlement and was enlarged in Norman times. The Norman and pre-Norman church structure remains intact and active to day within the Church in Wales. The Welsh language name for Neath is Castell-nedd, referring to the Norman Neath Castle, which was visited by English kings Henry Curtmantle, John Lackland and Edward Longshanks. Neath was a market town that expanded with the arrival of the Industrial Revolution in the 18th century with new manufacturing industries of iron, steel and tinplate. The Mackworth family, who owned the Gnoll Estate were prominent in the town's industrial development. Coal was mined extensively in the surrounding valleys and the construction of canals and railways made Neath a major transportation centre and the Evans & Bevan families were major players in the local coal mining community as well as owning the Vale of Neath Brewery. Silica was mined in the Craig-y-Dinas area of Pontneddfechan, after Quaker entrepreneur William Weston Young invented the blast furnace silica firebrick, later moving brick production from the works at Pontwalby to the Green in Neath. The town continued as a market trading centre with a municipal cattle market run by W.B.Trick. Industrial development continued throughout the 20th century with the construction by BP of a new petroleum refinery at Llandarcy. Admiral Lord Nelson stayed at the Castle Hotel en route to Milford Haven when the fleet was at anchor there. Lt. Lewis Roatley, the son of the landlord of the Castle Hotel, served as a Royal Marines officer with Nelson aboard HMS Victory in the Battle of Trafalgar. The River Neath is a navigable estuary and Neath was a river port until recent times. The heavy industries are no more with the town being a commercial and tourism centre. Attractions for visitors are the ruins of the Cistercian Neath Abbey, the Gnoll Park and Neath Indoor Market. Neath hosted the National Eisteddfod of Wales in 1918, 1934 and 1994. Letty Hayward born in Cwmgrach in 1939–1993, Welsh Ladies champion in Snooker twice and Embassy Ladies World snooker championship in 1976 where Letty played until the Semi-finals and she was beaten by the reigning champion Vera Selby. Letty Hayward received a Rolex watch & £500.00 for her semi-final finish. She has a daughter who succeeds her and still lives in the village of Glynneath next to Cwmgrach. Hugh Dalton (1887–1962, b. Gnoll), Labour politician, Chancellor of the Exchequer, 1945–1947. Tony Lewis (1938–, b. Swansea), first Welshman to Captain an England cricket tour abroad, (India, Pakistan, 1972–73).Led Glamorgan to 2nd County Championship, 1969. Writer and broadcaster. Jane Williams [called Llinos] (1795–1873), singer and compiler of traditional Welsh music. The Welsh Rugby Union was formed at a meeting held at the Castle Hotel in 1881. Neath Rugby Football Club, the famous and successful "Welsh All Blacks", play at The Gnoll. They have won 4 consecutive titles in the semi-professional Principality Premiership and 3 Swalec Cup titles (previously known as Schweppes and Konica Minolta Cups). Neath Athletic A.F.C. was the town's largest football team, playing at Neath RFC's ground, The Gnoll, and played in the top flight of Welsh football, the Welsh Premier League, until the club was wound up in 2012. In the 2006–07 season, Neath Athletic A.F.C. were promoted from the Welsh Football League First Division to the Welsh Premier League. Neath Athletic A.F.C. had an average of 300 supporters attending a domestic, Welsh Premier League game, which was typical of the Welsh Premier League. The previous borough council was absorbed into the larger unitary authority of Neath Port Talbot on 1 April 1996. The town encompasses the electoral wards of Neath East, Neath North and Neath South. Neath and the surrounding area is represented at Westminster by Christina Rees MP (Labour) and in the National Assembly for Wales by Jeremy Miles AM (Labour). As with the rest of the British Isles and Wales, Neath experiences a maritime climate with cool summers and mild winters, often high winds, and low sunshine levels. Railway Bridge over Dwr-y-Felin Road next to Dwr-y-Felin Comprehensive School. Neath railway station is on the South Wales Main Line. Great Western Railway and Transport for Wales serve the station with services westbound to Swansea, Carmarthen and the West Wales Line and eastbound to Port Talbot Parkway, Bridgend, Cardiff Central and London Paddington. Trains also run via Hereford and Shrewsbury to Crewe and Manchester Piccadilly. Neath bus station is at Victoria Gardens, a five-minute walk from the railway station. National Express services call at the railway station. From Victoria Gardens, First Cymru provides direct inter-urban services to nearby Swansea and Port Talbot in addition to South Wales Transport who provide many similar local services. The A465 skirts the town to the north east and provides a link to the M4. There are plans to regenerate around 1,000 acres (4.0 km2) of land in and around Neath town centre in the near future. The site once occupied by the previous civic centre will be redeveloped as a new shopping centre. The area around the Milland Road Industrial Estate will be redeveloped along with the area around the Neath Canal. On 27 November 2008, proposals for an "iconic" golden rugby ball-shaped museum, a library, heritage centre and other new facilities were announced for consultation. The developer, Simons Estates, says that it plans to start construction when the economic climate improves. In March 2008, the county's new radio station, Afan FM, announced plans to turn on a new transmitter dedicated to the Neath area in the summer. This will transmit on 97.4 FM, and will give residents of Neath their first taste of the borough's new local radio station, which already transmits to the neighbouring area of Port Talbot on 107.9 FM. The new transmitter for the Neath area was commissioned by Government regulator Ofcom on Thursday 23 October 2008. St David's Church, Church in Wales. ^ a b "Neath". Neighbourhood Statistics. Office for National Statistics. Retrieved 8 February 2013. ^ John Paxton, ed. (1999). The Penguin Encyclopedia of Places (Third ed.). London: Penguin. p. 628. ^ John Davies; Nigel Jenkins; Menna Baines; Peredur I. Lynch, eds. (2008). The Welsh Academy Encyclopedia of Wales. Cardiff: University of Wales Press. p. 603. ^ Wyn Owen, Hywel; Richard Morgan (2008). Dictionary of the Place-names of Wales. Llandysul: Gomer Press. p. 342. ^ "The Antonine Itinerary – Iter Britanniarum – The British Section". Archived from the original on 27 July 2009. Retrieved 2009-10-27. ^ "Eisteddfod Locations". The National Eisteddfod of Wales. Archived from the original on 23 May 2011. Retrieved 3 October 2010. ^ "The History of The Castle Hotel". Neath SA11 1RB, Wales: The Castle Hotel. Archived from the original on 14 May 2008. Retrieved 2009-02-05. The Castle Hotel was the meeting place for the founders of the Welsh Rugby Union. The inaugural meeting of the Welsh Rugby Union took place in the Nelson Room at the Castle Hotel on 12th March, 1881. There is a plaque outside the hotel commemorating the 100th anniversary of the Welsh Rugby Union, and at that time the Nelson Room name was changed to the Centenary Room. Still displayed in the room are the plaques of the original eleven members of the Welsh Rugby Union. ^ "Neath 1961–90 averages". Met Office. Archived from the original on 10 February 2001. Retrieved 25 Sep 2011. Wikivoyage has a travel guide for Neath. Wikimedia Commons has media related to Neath. Wikisource has the text of the 1905 New International Encyclopedia article Neath.